KIND words about Mrs Thatcher are not such a ­rarity these days – perhaps political expedience or the ­passage of time make them easier to utter. 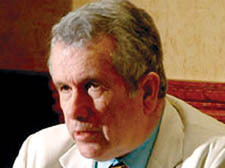 And this week they came from the man-in-the-white-suit, Martin Bell. It was Bell, the ­former ITN war correspondent, who won a seat in the House of Commons on an anti-sleaze ticket in the 1997 election which swept Tony Blair to power. And it was Blair who was the target for Bell’s odious comparison with the Iron Lady. Speaking at the LRB Bookshop in Bloomsbury on Tuesday, Bell contrasted Blair’s slavish adherence to the special relationship with the US president to Thatcher’s. She at least had been ­prepared to stand up to her ­president – Ronald Reagan – specifically on the Iran ­Contragate scandal, he said. Launching his new book, The Truth That Sticks, Bell drew parallels between and the Falklands war and the “illegal” Iraq war . Whereas Mrs Thatcher’s cabinet consisted almost entirely of members with a military background, he claimed politicians of today are prepared to go to war because they do not understand the realities of warfare. The book, which Bell describes as an obituary of the first 10 years of New Labour, is “fairly trenchant and plain ­spoken” he says, and explores the disaffection felt across the military from medical units to infantry regiments over the reasons cited for being sent to war in Iraq. So is Mr Bell a disappointed man, given that politics is a dirty game and his crusade against sleaze is unlikely to prevail?